Durable 11” Tactical Weaver Style Paintball Gun Rail Mount Accessory fits M16 hand guard to attach grips, lasers, lights & other rifle or tactical paintball gun accessories; easy to mount, tools are included. Turn your M16 into a beast by adding accessories to the handguard. To do this, you will need a mount. The 11 Inch Weaver Style Rail fits perfectly underneath the M16 handguard and makes a great platform for adding attachments. 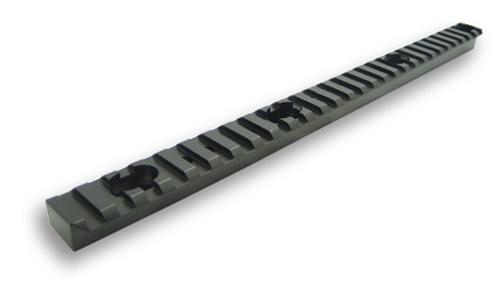 The 11 Inch Weaver Style Rail attaches easily to your M16 handguard and includes the mounting hardware. It will fit any standard style handguard, however is a bit long for an M4, yet perfect for the longer M16 handguard. After installation, you will be able to attach nearly any accessory that's compatible with a weaver or picatinny rail. Attach a vertical grip, flashlight, laser or even an awesome paintball grenade launcher to the underside of your M16 handguard with this rail. Buy the 11 Inch Weaver Style Rail for your M16 paintball gun from ChoicePaintballGuns for a super cheap price, easy ordering and fast shipping. Order now and you can have this part delivered right to your door in just a few days!